Abandon hope, all ye who download the app. Beyerdynamic make some of the best headphones on the planet. They’ve been doing it for quite a long time, so they know a thing or two about sound. But, despite their impressive range of cans, they have surprisingly few Bluetooth models. The Aventho Wireless is their attempt, perhaps, to change direction. In this review, we break down the Aventho Wireless’s sound, design, comfort and fit, packaging and accessories, specs and more. If you'd like additional options, check out our list of the best wireless headphones. We are going to talk, at length, about just how disastrous much of the Beyerdynamic Aventho Wireless experience is. They have so many things wrong with them, so many opportunities but are either missed completely or just utterly bungled, that it’s a miracle they work at all. We’ll get to all of that. Let’s talk about the base sound first – In other words, the sound without the personalization options applied. The company’s signature sound has always been smooth, elegant, and balanced. They never color the music unduly, and merely let it shine to its fullest potential. The only company that really matches it, in this regard, is Japanese powerhouse, Audio-Technica - their ATH-ADX5000 are the high-water mark. 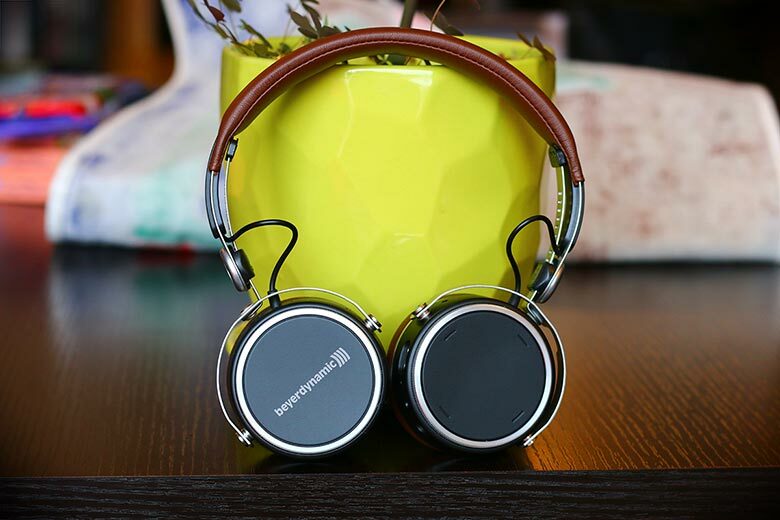 So, it’s no surprise that the Aventho Wireless sound exceptional. Had Beyerdynamic left off the sound personalisation nonsense (and fixed the controls), these would have been an absolutely stellar pair of Bluetooth headphones. Personalization is an idea we’ve seen in products before - most successfully in the recent Nuraphones (full review here). While the effect with the Nuraphones wasn’t always as good as the hype surrounding it, it was a fun and straightforward process to set up. The one for the Aventho Wireless, on the other hand, was an absolute, unmitigated disaster. Connecting is relatively easy - they use aptX Bluetooth - and you even get a posh voice in your ear telling you how much battery you have. The problem appears when you start using the accompanying app, and try to take advantage of the nifty features that the headphones sell themselves on. In order to start the personalization process, you need to download the MIY app. No, we don’t know how to pronounce it, so please don’t ask. The app is available for both iOS and Android, and once installed, it prompted us to pair our headphones with the phone. That was fine – but it also told us we needed to bond and initialize them. Bonding? Initializing? What does that even mean? At the time of writing, Beyerdynamic have not responded to questions about what exactly these two things are. To be honest, it doesn’t matter, because they wrecked everything. Shortly after it asked us to form a romantic attachment to our headphones, the app hard-crashed, shutting down our phone for a good five minutes. It did this multiple times, and it did it on multiple devices, both iOS and Android. The culprit, it turned out, was that the headphones needed a firmware update. Nowhere on the app was this mentioned - certainly not before the crashes occurred. It was referenced in the manual, and in a very tiny note on the company’s website. This is where we started to get really angry. You shouldn’t need a separate manual to set up Bluetooth headphones – especially not if there is an accompanying app. You shouldn’t have to dig deep into a website. We live in the 21st century, Beyerdynamic. We know how Bluetooth works. As it turned out, the firmware updater could only be downloaded from Beyerdynamic’s website. It was only available for PC (no Mac) and it was only available (as far as we could tell) in German. There's an English version here, but it's hard to find, and even the FAQ section of the app hasn't been translated. We don’t begrudge Beyerdynamic for having their software in German – they are a company from Germany, after all, with a massive customer base there. But if you are going to ask the Western world to download your app, it is the absolute height of forgetfulness and sloppiness not to translate it. Update: Here's Beyer's Gunter Weidemann: "The standard Bluetooth connection is used for music transmission and control functions (play/pause, next/previous track, calls, etc.). This works fine without the MIY app, as it is with every Bluetooth headphones. Due to the fact that Aventho wireless provides some more and unique features, the MIY app itself establishes a second, independent Bluetooth Low Energy (BLE) connection in the background. This is used for data communication between Aventho wireless and the app (hearing profile, tracking, touch pad sensitivity). The BLE connection is bonded and initialized during the start procedure of the app." That solves the mystery alright, but still seems...a little odd. Once we actually got the app working - once we’d bonded sufficiently with our headphones and knew their favorite color and how cute they look when they snore - it worked reasonably well. It even does some clever things: tracking how long you listen to the headphones everyday, giving you a warning when it thinks your hearing is being damaged. And you can, of course, personalize the sound - something we’ve seen before, not just in the Nuraphones, but in cans like the EVEN Earprint H2. But once you fight past the firmware updates and the bonding and initializing and the five-minute hearing test, the result just isn’t worth the effort. Again, it’s fine. It works. You can set the sensitivity of the effect, and there’s no denying that it does open things up and make them a little bit clearer. The detail and precision that is inherent within the headphones is brought even more to the fore, and there's a touch more extension in the bass. The soundstage feels wide, if not drastically so. But, since the headphones are already pretty clear to begin with, this feature doesn’t offer enough of a reason to exist. It’s a weird little quandary, a vicious circle in the audio world. A hearing test can make a subpar pair of headphones sound superb. But if you have an excellent pair of headphones, there’s a limit on how much you can really improve them. It’s worth mentioning the Nuraphones again, because they are the gold standard. The process is automatic, takes sixty seconds, and is excellent fun. All you have to do is sit there and watch your own personalized, colored blob form on your phone screen, like a particular Pokémon unique to you. And it sounds good. By contrast, Beyerdynamic’s process takes a full five to six minutes. It involves you pressing a button when you hear a tone, and letting it go again when you can no longer hear it. It is dull, frustrating, and feels wobbly as hell. It is a process designed by engineers, who have given precisely zero thought to what people actually want, or how they might use the thing they’ve built. In that sense, this – beyond any issues we had with the setup and functionality – is the Aventho’s biggest failing. Take away the sound personalization, and you’re left with a pair of headphones that’s easily beaten by something a lot simpler and better-designed, like the dashing Bowers & Wilkins PX. If you really want to experience the Beyerdynamic sound, there are plenty of excellent models available that will allow you to do just that, at a significantly lower price - the aforementioned Amiron Homes, for one, and older models like the DT770 Pro, for two. This feels like it doesn’t do enough to justify its own existence. A word on the actual design of the headphones. It’s…fine. It works well. But to our eyes, it’s weirdly industrial, and almost unfinished. The soft brown leather was nice enough, but the inner height adjusters for the headband looked way out of place, as did the wires jutting from the band. Even at maximum length, these wires never sat flush with the band itself. Begging the question: why are they so long? They look like a pair of rabbit ears on an old TV. However, it must be said that battery life was decent. We didn't quite get the advertised thirty hours, but we came close - twenty-seven at moderate volume - and recharging took no more than a couple of hours. They have that going for them, at least, and they match up well with something like the excellent Sony WH-1000XM2s, which have thirty hours of battery life. But we can’t think of another pair of headphones that have promised so much and delivered so little, in terms of basic design. Boy, what a mess. But it was the touch controls that nearly made us forsake our sacred vow to review these headphones in full, and hurl them into traffic. You can adjust the sensitivity in the app. It doesn’t help. Any attempt to change the volume or track by dragging your finger across the right earcup will, in almost all circumstances, do the exact opposite of the thing you want. Swiping a finger forward to skip a track will reduce the volume to zero. Trying to pull it upwards will move it all the way to a hundred. It’s as if something inside the controls is malfunctioning and misreading everything you do. It doesn’t help that the little depressions on the cup that you used to guide your finger placement are hopelessly inadequate, easy to pass over with a swiping finger. Calling Siri or Google with a two-second press felt OK…But when the only successful input is calling another bit of technology for an assist, you need to take a long hard look at what went wrong. Given that the Parrot Zik 3s (full review here) did this without a hitch two years ago, Beyer’s got problems. This is something that Beyerdynamic do get right. They already hold the record, in our eyes, for the most comfortable pair of headphones ever designed – those would be the Amiron Homes (full review here). Coincidentally, those headphones are soon to be available as a wireless version, although we aren’t sure how keen we are to test them at this point. Still, the Aventhos are a joy to wear. Ignoring their issues with looks and functionality, there’s no question that they feel terrific. The clamping pressure is spot-on, tight enough to stay put without crushing your skull. The soft on-ear cups cocoon your lugs in buttery leather, and they’re lightweight enough to wear for hours at a time. Whether you will have the patience to wear them for hours at a time is another story, but they definitely hit this checkbox spot-on. We are pleased to report that there is at least one other thing Beyerdynamic get right: they supply a pretty magnificent carrying case. It doesn’t quite have the panache of the canvas case that came with the Master & Dynamic MW50s (full review here), but it’s still very good indeed. It’s also made of canvas, grey, with a lovely texture – the kind of thing you’ll want to keep around. There’s even a sweet little stash pocket inside for the included charging and auxiliary cables. The packaging is unremarkable, if reasonably effective. You can recycle it more or less instantly. The Aventho Wireless headphones are superbly comfortable to wear. They come with a great range of accessories. ​The base sound quality, before sound personalization is used, is very solid. The headphones have a god-awful app experience that badly needs a redesign. The horrendous touch controls made us want to destroy the headphones. The Aventho Wireless boasts a dull, unfinished-looking design. ​The headphones are hideously expensive for what you get. There are plenty of other options available, and you could definitely pick any of these over the Aventho Wireless. Seriously: any. If you want excellent sound personalization, the Nuraphones are the headphones to go for. They definitely have their downsides – they’re tough to wear for long periods of time, and the base sound is awful. But the setup, app functionality, and overall effect are absolutely superb. They come with a genius carry case, too. We do think there are definite improvements to be made in the next version, and they’re probably a little too expensive right now ($400, Despite being less expensive than the Aventhos, is still to much). Of course, sound personalization is still new technology, and it’s only used in the Nuraphones, the Beyerdynamics, a pair of $1,500 AKGs...and the EVEN Earprint H2. This excellent and relatively cheap pair looks and feels great, and offers more impactful (and more fun) personalization than the Beyers. Their vocals aren't quite as assured, but they are still a very worthy pair of headphones. They cost much less than the Beyerdynamics, too, at $299. And what if you want something that satisfies on looks, too? That’s something the Sony’s don’t really do. In that case, check out the Bowers & Wilkins PX. Design-wise, these smoke just about any challenger. B&W’s updates to the legendary P7s look absolutely fantastic, with gorgeous, sweeping curves. They’re probably not quite as comfortable as the Aventho Wireless, but more than make up for it with excellent sound quality and intelligent design. There’s no app (thank goodness) but you can do clever things, like lifting the ear cup away to pause the music - meaning you don’t have to hang them around your neck to talk to an annoying coworker. At the same price as the Nuraphones ($400), you’d be crazy not to buy these. If you absolutely are set on a pair of Beyerdynamics, then do yourself a favor. Forget about wireless. Forget about cute personalization. When the company focuses on audio quality and good headphones alone, brilliant things happen. The Amiron Homes are slightly pricier than the Amirons - $599 to the latter’s $449 – but are so much better that it's actually comical. They are the single most comfortable pair of headphones we’ve ever tested, and we love ours to pieces. Buy them. When we evaluate any gear on this site, we always ask ourselves: what is the manufacturer trying to achieve? Did they achieve it? How well? With the Aventho Wireless, Beyerdynamic set out to create a pair of headphones that could read your mind, deliver you all the information you needed, and provide an effortless experience. And in this, they failed. Spectacularly. This happened because the headphones went direct from a blueprint on an engineer’s desktop, to the factory floor, to the shops. If a user-experience designer ever looked them over, they must have done so after a very long night of drinking großes maß (one-liter beers that you need serious biceps just to lift off the table). Beyerdynamic have proven, again and again, that they can make excellent headphones. They have demonstrated mastery of models which deliver both superlative sound quality and gorgeous, distinctive design. So, what happened here? What chain of confused emails and half-cooked, focus-grouped ideas led to this? They’re expensive, too: $449 at the time of writing. There is just no way – at all, ever - that we would pay that much. It puts them among the most expensive wireless headphones on the market; we can only think of a handful that top them, including the $500 B&O Beoplay H9i. What’s crazy is how many awards these have already won, taking home an Innovation Award at CES 2018 and winning Best Headphone Portable at CanJam Europe. We can only assume those responsible were themselves feeling the aftereffects of a few großes maß.